If you are on this site, then you probably have to deal with medical waste all the time. But have you ever wondered what happens to the waste you produce once it leaves your facility? Over the next few blog entries we are going to discuss the three most common forms of treatment for regulated medical waste. In this post we will start off by diving into the process of incineration. Incineration is still today the most widely used process for treating regulated medical waste. The process involves burning the waste produced at very high temperatures. There are three main types of incinerators. They are controlled air, excess air, and rotary kiln. As controlled air incinerators make up more than 95% of the incinerators used, let’s look a little deeper into how they work. The first step in this process is to feed the waste into the lower combustion chamber. Combustion air then enters the lower chamber from beneath the incinerator hearth. The temperatures in this chamber can reach 1,400°F-1,800°F, which sterilizes and dries the waste. 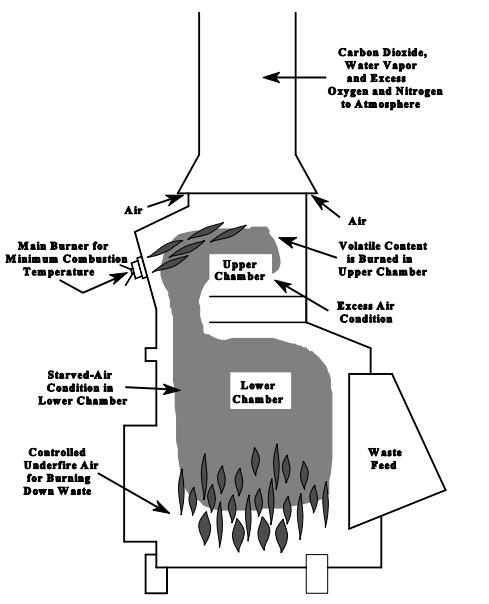 In the second step, excess air is added to the gases formed in the lower chamber to complete combustion. The temperatures in the second chamber are significantly higher than those in the lower chamber, ranging from 1,800°F to 2,000°F. Once the waste is processed through both combustion chambers, the ash and waste feed are ready to be removed, which can be done manually or automatically. (U.S. Environmental Protection Agency) See below picture for a detailed diagram. Alternatives to incineration are available. Stay tuned for our next section delving into the autoclave treatment processes of medical waste. Your Medical Waste Disposal Provider: Friend or Foe? Sometimes when you have been with a company for years or even decades, you assume that you are being treated as the loyal customer you are. You may assume that your pricing and quality of service will stay relatively close to the same. This however, is not always the case with some of the big national Medical Waste Companies. One company proves this more than any other. With more than one million customers worldwide, Stericycle holds the majority interest for medical waste disposal. That being said, just because they are the biggest, does that automatically mean that they are the best that is out there? Before making any decisions about who to do business with, a savvy person should always do their research. So let’s do just that. Over the last three years alone, Stericycle has been involved in 18 class action lawsuits in various states. In a recent article by Hartford Business out of Connecticut (Pilon, CT docs join lawsuit frenzy against medical-waste giant), we see that the company is undergoing yet another claim against them for having customer service agreements that are “deceptive or misleading”. But what does that actually mean? Stericycle’s contracts have a clause that says they can incrementally raise prices to account for rising operational costs or legal changes. In the article by Hartford Business as well as an article published by the National Dental Association (Soderlund, ADANews Stericycle contracts: Read the fine print), we see, however, that Stericycle applies on average an 18% automated increases to its customers.The lawsuit in Connecticut claims that these increases are “a systematic practice and policy that Stericycle regularly employs to generate revenues”. With customers like the ones quoted in the article by the ADA, who noticed a nearly 250% increase in their bill since they began service with Stericycle, it makes you wonder if the claims in these lawsuits may not be true. Knowing the information that you now know, have you taken the time to see how you are truly being treated by your provider? There is a better option. If you would like to know more about our pricing, services, agreements, or have any other questions please contact a representative at (877) 670-6522 or by email at info@managemed.us. Feel free to also check out the articles quoted through the links below. * The views and opinions expressed in this article are those of the authors and do not directly represent the views of managemed as a company. What is OSHA Training and why do I need it you might ask. Well, we are here to help answer all of your questions and provide economical solutions. The US Department of labor states that, “Employers have the responsibility to provide a safe workplace. Employers MUST provide their workers with a workplace that does not have serious hazards and must follow all OSHA safety and health standards. Employers must find and correct safety and health problems. Employers must provide safety training in a language and vocabulary workers can understand. OSHA further requires that employers must first try to eliminate or reduce hazards by making feasible changes in working conditions rather than relying on personal protective equipment such as masks, gloves, or earplugs. Switching to safer chemicals, enclosing processes to trap harmful fumes, or using ventilation systems to clean the air are examples of effective ways to eliminate or reduce risks.” "UNITED STATES DEPARTMENT OF LABOR." OSHA Frequently Asked Questions. Web. 08 Apr. 2016. This, put simply, means that as an employer, you have the responsibility to make sure all of your employees are working in a safe environment and are trained to handle any possible situation that may arise. Whether that has to do with bloodborne pathogens, needle safety, how to properly dispose of medical waste, or even just workplace accidents. With our OSHA training you have access to mandated training programs for employees, federal regulation information, infectious information, safety plans, audits, and much more.